Ex-interior designer Dimitra turned over a new leaf after returning from maternity leave. She lives in Thessaloniki, Northern Greece with her seven-year-old son. For several years I had a career in kitchen design that I loved, and it provided a great salary and a good life for my family. However, when I left for maternity leave, I lost my job when the showroom I was working for shut down. After 11 months of unemployment, I found a job in retail selling women’s accessories, but that was a far cry from what I used to do. When this happened, Greece was undergoing a financial crisis, and I was earning 1/4th of my previous salary working in retail. I was employed under undesirable conditions with poor management. Retail and sales are a high-stress combination — it just wasn’t for me. Once I quit, I had to take some time to figure out what I wanted to do moving forward. I’m so glad that I did! During that time, I started taking courses on Coursera for fun. Anything that triggered my curiosity was fair game. That’s when I discovered that I had an interest in the health sector. My courses on Coursera helped me start a new path in my life. 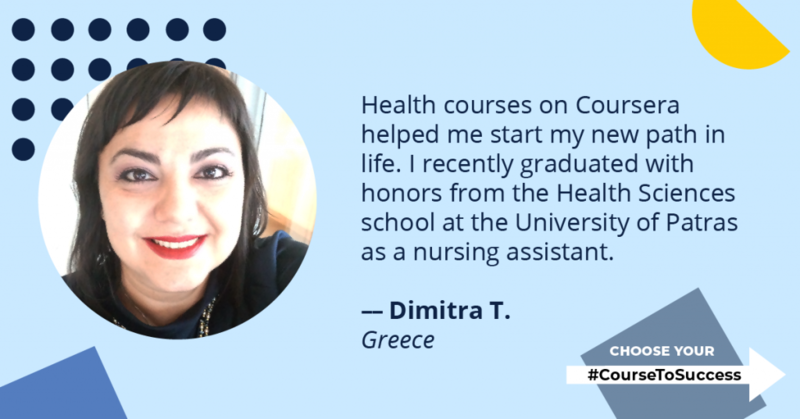 At the end of last year, I graduated as a Nursing Assistant with excellence from the University of Patras in Pharmacy. I have applied for nursing positions at four hospitals in Thessaloniki, and most likely I’ll be starting next year at Ippokrateio Hospital, one of the largest hospitals in Northern Greece. I can’t wait to begin practicing! 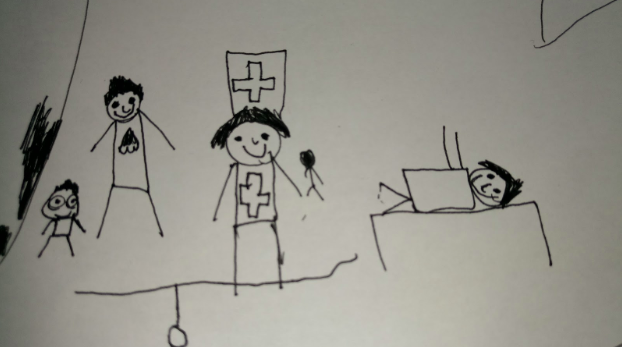 A picture of Dimitra’s time in nursing school illustrated by her son. Taking courses on Coursera helped me realize that it’s never too late to start something new. Never settle for the wrong job and unhappiness. If I can do it, you can do it too.